For as long as I can remember, the only good thing about Passover food has been the matzoh candy that my mom makes every year. 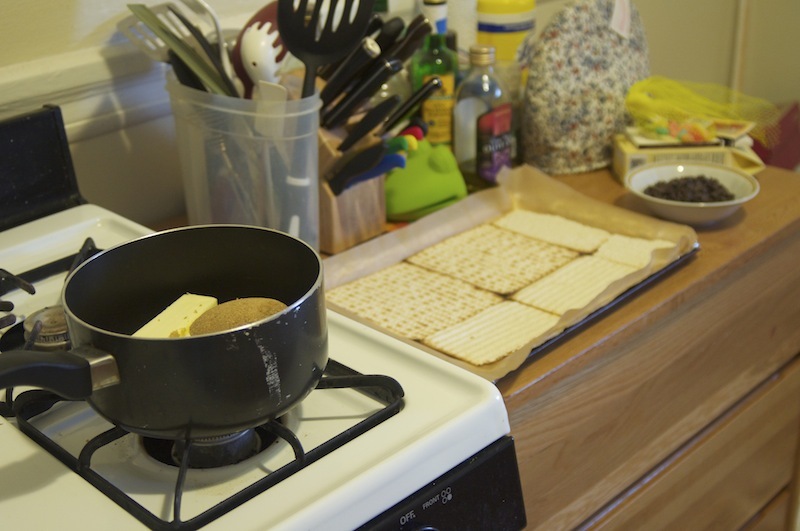 For a few years after I left home, my mom would make a batch to send to me every Passover. This year I decided it was time for me to learn to make it myself. Now I can start sharing with all my family and friends while still having enough candy for my own sweet tooth. I had thought that my mom used an old family recipe, but when I asked her for it, she gave me a (sticky) print out from a now defunct website. A bit of research reveals that this is in fact a recipe by Marcy Goldman, taken from A Treasury of Jewish Holiday Baking. I have retyped the recipe from my family’s original copy below, with my notes. I believe Epicurious has also reposted the recipe here. 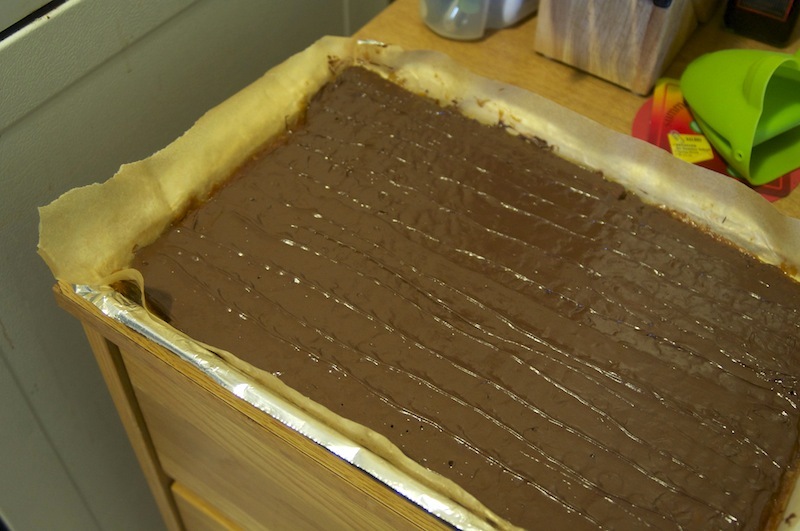 Line a cookie sheet completely with foil. 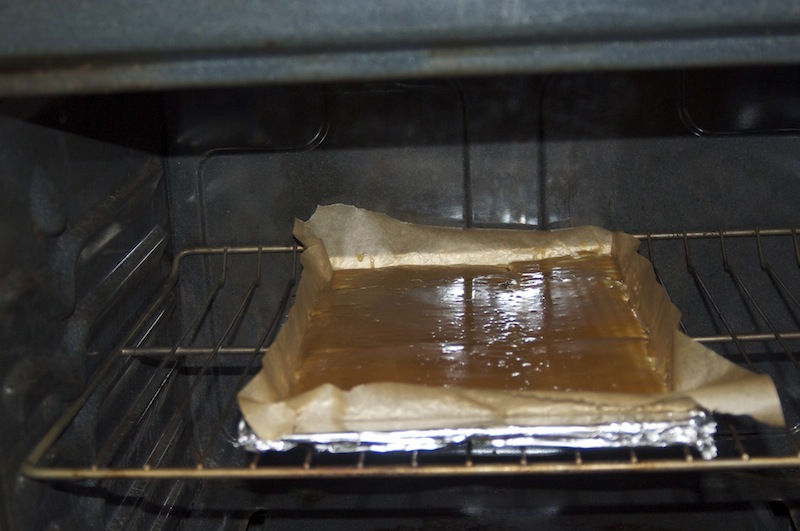 Cover bottom of pan with baking parchment – on top of foil. This is very important as mixture becomes sticky during baking. (I am not kidding. I know it is wasteful. Just do it.) 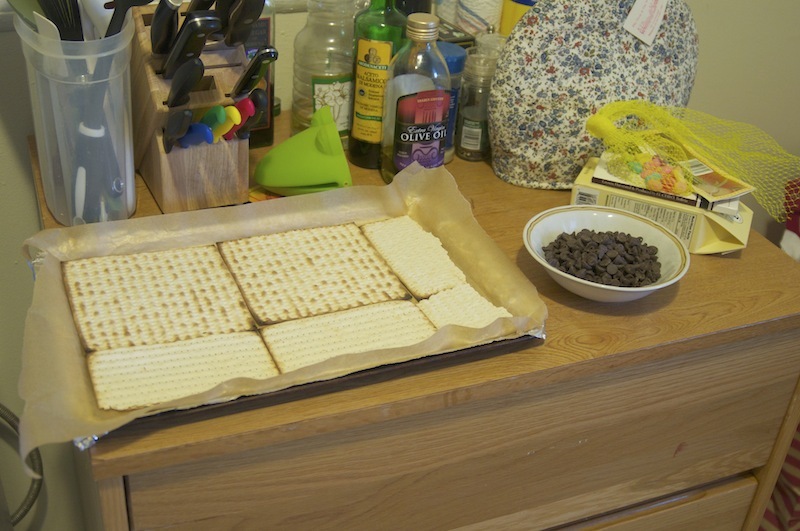 Line bottom of pan evenly with matzoh boards, cutting extra pieces of matzoh, as required, to fill all the space on the cookie sheet as evenly as possible. Combine margarine or butter and brown sugar in a 3 quart, heavy-bottomed, saucepan. (I’m poor and none of my saucepans are actually heavy-bottomed. Turns out it doesn’t matter.) Cook over medium heat, stirring constantly, until mixture comes to a boil. Continue cooking 3 more minutes, stirring constantly. (It is important to time this step carefully so you do not burn the mixture.) Remove from heat and pour over matzoh. Place 2 cups of white sugar in a heavy bottomed saucepan with 2 tablespoons of water. Heat on low to medium until sugar dissolves. Continue cooking until mixture turns medium amber. Pour over matzoh which is laid out on baking sheets. 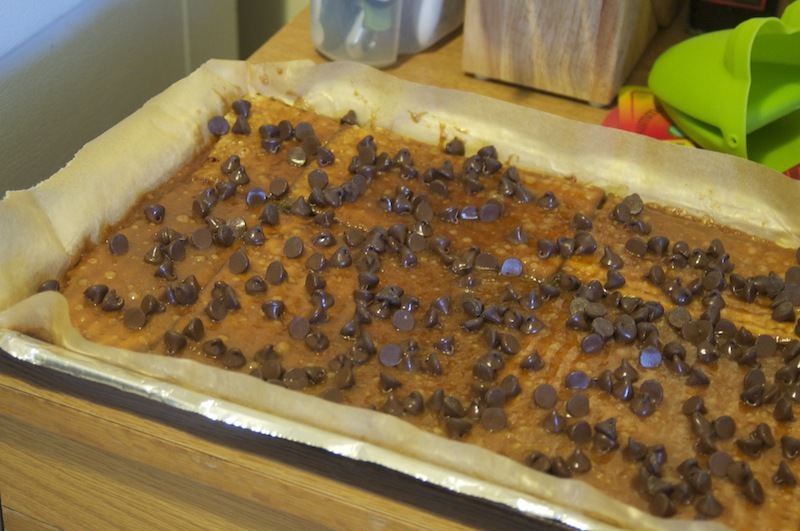 Spread and sprinkle on chocolate chips. No baking for this version.